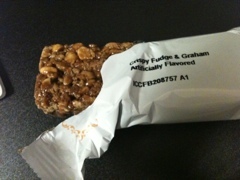 My snack for the afternoon was Crisp ‘n Crunch Fudge Graham Bar. About as interesting as it sounds, but edible. The packaging didn’t have any specific calories on it, but by doing a quick search of some diet sites I’d estimate it was about 150 calories.